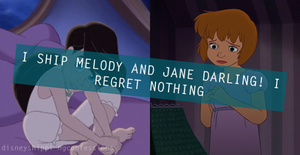 Shipping Confession 1#: Jane (Peter Pan) and Melody. Yes it's true. I hope wewe Jim/Melody shippers don't have a problem with my opinion au me for that matter.... Wallpaper and background images in the Disney crossover club tagged: photo jane darling melody. You guys do respect my opinion, right? Yes, but I don't know if her name's actually Darling, since that was her Mother's maiden name. Jane, Danny and Wendy would now have whatever Edward's last name is.